Watch as your Disney characters parade on themed floats down Main Street, sing & dance along to your favorite Disney music. Location: Town Square, Magic Kingdom to Frontierland. The parade starts in Town Square, runs down Main Street, through Liberty Square to Frontierland. Anywhere along this route is a great place to watch. The parade makes three stops along its route, one in Frontierland, one just past the hub on Main Street, and one on Main Street just before Town Square. The most popular place to watch is on Main Street, which starts to fill up 30-60 minutes before the parade begins. The parade music was recorded in London by members of the London Symphony Orchestra and the Royal Philharmonic. 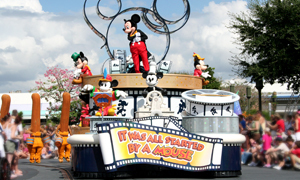 This parade is inspired by the Walt Disney quote: "It all started with a mouse." There are designated viewing areas for Guests with disabilities. These areas are filled on a first-come, first-served basis. Locations: Town Square, opposite City Hall; East side of Hub; Liberty Square, opposite Liberty Tree Tavern.